Every time I go to Saviour’s house, I nearly always find her sitting at the table with one of her inseparable companions – the book. While Saviour and I are always squabbling about some triviality of life, she sits there looming over us with book in hand, until she says something that brings us back to our senses. She is an avid and omnivorous reader. Today she could be reading a book about Houdini, tomorrow another about gardening. She finds life attractive from all aspects and in her meaningful silence she never ceases in her pursuit to unravel the meaning of things, which for us have no meaning at all. Though Ebba does not spew words unnecessarily, she is inseparable from them when they meet in their multitude to form a book. Ebba is inseparable from her kitchen. Her kitchen is practical, colourful, unassuming and yet so gastronomically alive. Though Ebba is no glutton she likes eating fine food. Her cooking is very much like her paintings – surprisingly inviting and good. I will never forget her venison with chestnuts and pulses. Though I am not keen on eating vegetables, the way she conjures up her recipes has been one of the few ways I managed with anything grown in the ground or green in my plate. Though there was something bohemian about her cooking, she always managed to make flavours meet harmoniously in a pot or pan – that same trail of harmony she leaves behind her when she hovers from one room to another. Ebba and Saviour do not have children. It is only now that I have come to know that this is by choice and not design. Ebba and Saviour wanted themselves to themselves. But Ebba did conceive scores of offspring: she had her paintings and like everything that she loves, Ebba was inseparable from them. Now others may say whatever they want to of her artistic experience, and I know I’m no art critic. But I stubbornly maintain that somewhere in Ebba’s “children” there are the genes of Paul Gauguin. The continuous use of foliage, the bright, exotic colours and the deep sense of spirituality and creation, are unmistakeably Gauguin’s. Very much like him, Ebba left her country for a more temperate zone and what’s more, she fell in love with the locals in the same way Gauguin did with the Haitians. But what impresses me about Ebba is the manner with which she wraps her paintings. The wrapping is as colourful and meaningful as the contents, as if to warn you to take care of the child. She never sells or gives a painting, but she parts with it. Ebba in inseparable from the members of her family. I mean Saviour, her cats, and her dogs. She has this special attachment to the kelb tal-fenek. I never forget the good times when knocking at the her door meant having Trulla and Otto coming charging at me in a bout of happiness, with Ebba running after them to save you from their claws. Strolling with Oskar, Trulla and Saviour in what has remained of the countryside in Naxxar seems to be one of her daily joys. Ebba was want of sketching and writing at the same time. To make permanent the fleeting joys of life and make lasting the bond with her cats and dogs, she has depicted them in a set of two books which have in them that sense of innocence that reminds me of Saint Exupery’s Le Petit Prince, albeit in a lighter and less philosophical form. But Ebba’s greatest of bonds and inseparability is with the mercurial Saviour. Their characters seem to be in perpetual mutiny against each other. Ebba is always as serene as a lake, while Saviour is always like Mount St Helena seconds before erupting. Ebba takes life seriously and cautiously; Saviour exceedingly seriously and without caution. Very much like the Maltese, Saviour shouts at people to drive his point home and never does; and very much like a German, Ebba whispers and you get her point. But there is one moment where they meet and where others in this day are miserably failing – love. When I last saw Ebba before she walked out of life, I found Saviour next to her bed clinging to her hands. He was visibly in pain. What Saviour did not realise was, that he was not next to a deathbed, but a flower bed: Ebba is not dying but blooming. Ebba will never let loose of her deep sense of inseparability. 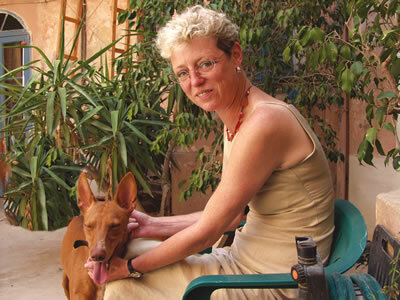 Ebba von Fersen Balzan, 50, artist and representative of the Friedrich Ebert Stiftung, born 30 August, 1957 in Darmstadt, Germany, married to Saviour Balzan, died 16 March, 2008. The protracted illness that Ebba von Fersen Balzan had to suffer does not mitigate the sad and premature loss brought about by her demise. I am writing these words not just because Ebba happened to be the wife of your newspaper’s editor but mainly because whenever I met her she always struck me as a softly spoken but sharp witted and warm hearted, intelligent person with a firm cultural grasp and a strong artistic streak. Perhaps even more important than that she always proved to be an engaging personality to meet and talk with. Saviour, family and friends have all my sympathy and solidarity. I would like to convey my deep sympathies to Saviour Balzan on the demise of his wife Ebba. In times like these we experience a mixture of emotions between bitterness, anger and sadness. Until we remain with the living we have to bear what comes our way waiting for the wounds to heal, waiting for time to takes its toil upon us. I am sure that Ebba is already deeply engrossed at engraving the pictures of natural blissfulness with landscapes from heaven. May Saviour find solace in his relatives and friends’ support throughout this difficult moment. In Ebba von Fersen Balzan we mourn a good friend, a woman gifted in so many ways. A versatile artist, continuously searching for new ways of expressing herself. A tireless worker for the Friedrich Ebert Stiftung and workers’ movements. A generous and thoughtful friend, a frequently patient companion to her volatile husband and the two exuberant (extremely so!) dogs. A faithful correspondent and sharer of recipes, an avid reader and lender-out of books she had discovered and loved. A woman with deep insights, which she wanted to share with us. And there was the quirky sense of humour. An inspired cook – meals at hers and Saviour’s house, often at a moment’s notice, were always adventurous, as was the conversation.